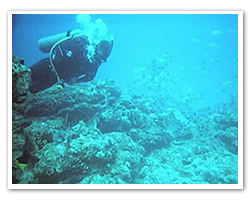 We offer scuba diving and Snorkeling options near to dominical, uvita, ojochal in the Costa Ballena area. Discover the unspoiled waters of Isla del Caño and the Ballena Marine National Park. Caño Island is one of the best places for scuba diving and snorkeling in Costa Rica. Located 8.5 miles from Osa Peninsula, this area is a marine reserve with 6,200 acres. The border of the island has white sandy beaches and a well protected inshore coral reef, great for snorkeling and diving in Costa Rica. It is the best spot in Costa Rica for scuba diving and snorkeling because of its visibility about 65-70 feet deep (20 meters). You can see many different species of fish, turtles, manta rays, dolphins, sharks and whales in each Scuba diving and Snorkeling tour. The Snorkeling tour starts early in the morning at the base of the hotel by bus at 6:30am: Breakfast at Sierpe. A 1 hour and a half boat ride to Caño Island. 2 hours of snorkeling in the clear waters. After lunch, 2 hours of hiking on the Island: a well maintained trail leads uphill into a rain-forest environment where you can see 165 foot high trees (50 meters). You’ll also see an archeological cemetery of pre-Colombian tombs along the trail. Hundreds of perfect aborigine spheric stone balls of different sizes were discovered after Columbus arrived and most of them were taken off the island. 2:30PM: return. 4:30PM: Sierpe, and 5:30PM: hotel. Park entrance fee, professional guide and lunch are included. 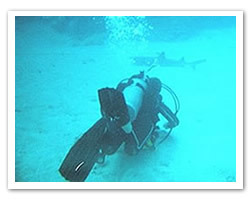 This Scuba Diving and Snorkeling tour starts at 6:30AM from the Mystic Dive office. Boat ride to Caño Island. There, snorkeling or diving, 2 sessions, one in the morning and one in the afternoon. Tour includes tanks, equipment, lunch, guide and park fees. Return at 4:00 PM. Minimum of 4 divers or 6 snorkelers. This Park was created to preserve the coral reef life: 9,000 acres of sea which surround «Las Tres Hermanas Islands» and «Ballena Island» plus the very beautiful rocky beaches and sandy beaches of palm trees and almonds trees around the bay of the park. The park covers 20 miles (13km) of coastline from Punta Uvita to Playa Piñuelas. Here we can find sponges, corals, mollusks, crabs, green iguanas, marine birds, etc. The place is considered as the meridian point of reproduction for the hunchback whales, which come to these tropical waters during the winter. You can enjoy scuba diving and snorkeling here. 1. The snorkeling tour begins at Uvita beach and includes snorkeling in 2 places: the Uvita Tombolo (4 species of corals) and Ballena Island. Include: equipment, guide entrances fees to the park. The schedule is subject to sea tides. 2. This snorkeling and diving tour is given twice a day: morning or afternoon. It starts at Piñuelas Beach. The tour includes 2 tanks, equipment and a guide for scuba diving, and snorkeling gear and guide for snorkeling. Minimum of 4 persons.